So far December weather for Reigate and across much of S England has been much the same for a while: breezy westerly winds and exceptionally mild on occasions with December temperatures breaking records in Reigate: the highest December temperature of 12.7C was recorded on Dec 18, the highest average and highest minimum were also records broken this month in the town. The December CFS chart for Bournemouth temps show how much time they have been above average this month so far. Whilst it has been mostly relatively mild this month so far in the UK, large parts of the rest of the N Hemisphere has been even warmer with much of N America and parts of Russia being anomalously warm too. On the other hand E Siberia has been very cold with Verkhoyansk falling to -50C at times. Whilst a colder spell is expected to arrive soon after Christmas this will not be sufficiently extreme or long enough to move 2014 away from a record breaking warm year. The Central England Temperature records go back before 1780 and 2014 looks almost certain to be the warmest ever recorded CET with an anomaly of +1.49C above the long term average. This matches 2014 as a warm year globally, if not quite the very warmest. So, apart from the rather underwhelming “bomb” depression earlier in the month, why has the weather been so mild, uneventful and unchanging for much of December, so far? An immediate cause of our quieter weather this December is the jetstream being less active than last year. 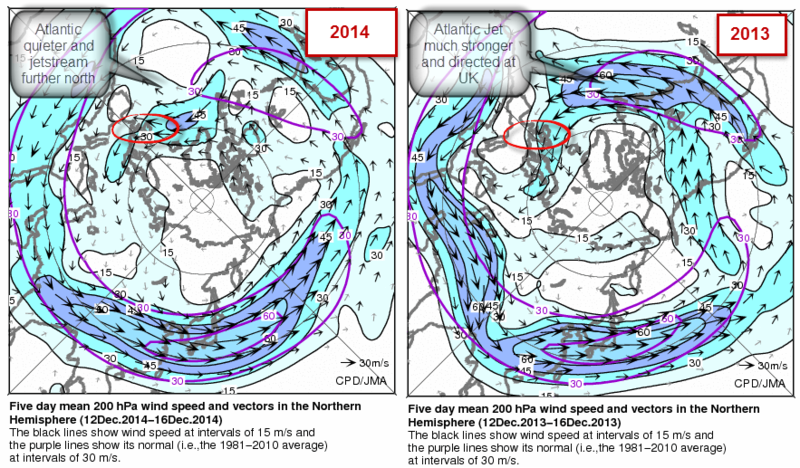 On the charts below spot how much more active the 2013 jet was at the same time last year across the Atlantic. 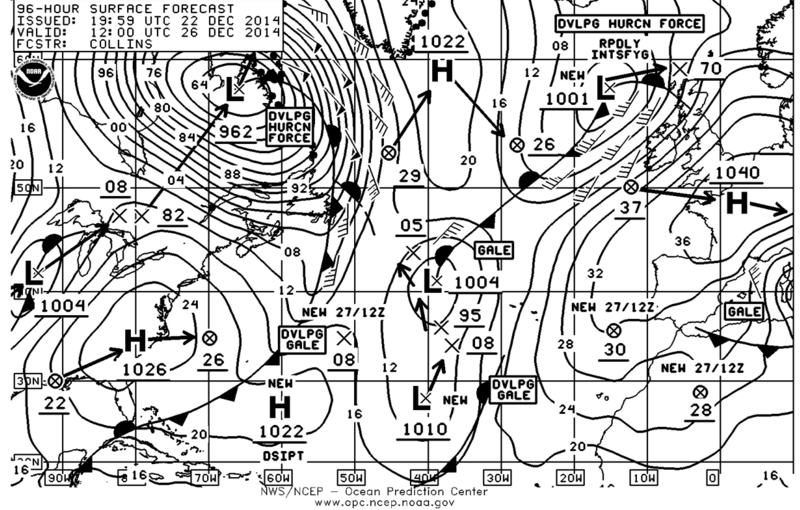 A succession of Atlantic storms were driven headlong at the UK by a powerful jetstream which sat further south. This year the jetstream has mostly been further north than the south of the UK and has been more meandering (meridional) and less powerful: hence fewer and less powerful storms for us in the south, most of the storms have tracked to the north of Scotland which has had an “ordinary” December of high winds and heavy rain! The reason for our milder than usual December is that much of the time our winds have arrived from a warm SW direction round a persistent HIGH over Europe. We have had few incursions of Arctic northerlies, as yet. Nevertheless, for parts of the month especially for the NW of the UK, there has been a sustained NW wind associated with high pressure over the Mid -Atlantic and LOW pressure over Iceland and this has pegged down our overall temperature anomaly to 1C above long term average. This pattern of broadly westerly winds is called zonal and is indicated by a positive North Atlantic Oscillation (pressure low over Iceland and high over the Azores). While the jetstream controls our synoptic scale pressure patterns, a more remote driver of our overall weather in the Atlantic mid-latitudes is the rather more geographically far-flung “Madden-Julian Oscillation”. The MJO is a cycle or wave of weather disturbances (clusters of convective storms) that start in the Indian Ocean and move east through the tropical oceans into the Pacific and beyond. It usually peters out across the Atlantic but can be observed to continue as an unbroken oscillation into the Indian Ocean where it starts another Phase 1 again. The MJO connects up with observed known weather patterns in the Atlantic and has therefore got an impact on UK weather, especially apparently, in years of weak or neutral ENSO (el-nino southern oscillation). This year is currently a weak El Nino. With the MJO in Phase 3-4 then a positive NAO is usually favoured but is not fixed of course, yet more drivers are likely to influence proceedings in the new year, not least “sudden stratospheric warming”. When upper winds (including the jetstream at 300-250hPa) match the direction of those at the surface, the weather tends not to change very much over quite long periods, like recently. Wind direction and air masses can tell us a lot about how the weather will change and sometimes this is helpful when forecast changes are uncertain or simply fail to arrive when expected. To an observer on the ground clouds at different heights can sometimes appear to be moving in different directions. If on such occasions, the observer sees the clouds moving perpendicular to each other then a rapid change in weather is likely to be on the way, either good or bad! The so-called “crossed-winds rule” is handy if you want to know how quickly expected weather events will arrive, especially if you are out and about on a day when expected changes are afoot but the timing is uncertain from forecasts. This could prove handy later this week when a large storm might upset our run of benign conditions but the exact timing of fronts and events is uncertain, especially at this range! The storm, expected to intensify rapidly in the Mid-Atlantic during Boxing Day (yes, a possible rapid cyclogenesis bomb depression) could take a track modelled by the GFS that runs from the N of Scotland down through the N Sea. This SE track could pull in strong Arctic winds and, combined with high spring tides and high waves, this could cause a storm surge event for E coasts of the UK. Note this is too far off to be certain at this stage. Other models, such as the ECM and UKMO have different tracks that take the LOW on a less potentially damaging course. Nevertheless, the models are worth watching because on some tracks the synoptic situation is similar to the 1953 storm which caused a lot of coastal flooding. Of course, sea defences are much improved since 1953 so, even if the track was similar, it would be unlikely to cause anything like the same impacts. It is also noticeable how similar the zonal pattern preceding the 1953 storm is to the current synoptic pattern: a strong positive NAO was present with both (see below). It will be necessary to see clouds at different heights – especially those wispy cirrus ones to check high altitude jetstream winds. If it is completely overcast then forget this unless you happen to see breaks in the low cloud. Find the surface wind direction: look at lower cumulus clouds or just local wind vanes or weather stations. It’s important to get the correct surface wind direction though so don’t rush this bit. Watch the direction of any cirrus clouds: check this with an aerial or static object. If they can be seen to move at all then they will be shifting fast, because cirrus can be 10km up! The best cirrus for this is hooked mares tales or jetstream cirrus which appears in long impressive streaks along the core of the jetstream or similar upper winds. The more fuzzy edge is on the tropical warm side and the firm sharp edge to cirrus, if this can be spotted, is on the polar air side. Now, the rule: stand with your back to the surface wind and if the cirrus (upper winds) come from the left then the weather will get worse. The more perpendicular the winds (right angles) the more rapidly the weather will deteriorate. If the surface and upper winds are going the same way, then there will be be no immediate change, or just very slow change. If the upper winds come from the right then the weather will start to improve. On the back edge of the storm, chilly Arctic air could bring down an active cold front with snow showers on the back edge into the SE, but more likely these will be restricted to NE/East coast. It’s ages away so no details are possible but this storm looks one to watch. Finally, the longer range outlook is rather uncertain! Signals such as stratospheric warming, forecast to take place into early January, favour a cool January with the break-down of westerly flows into occasional cold Northerlies / easterlies. 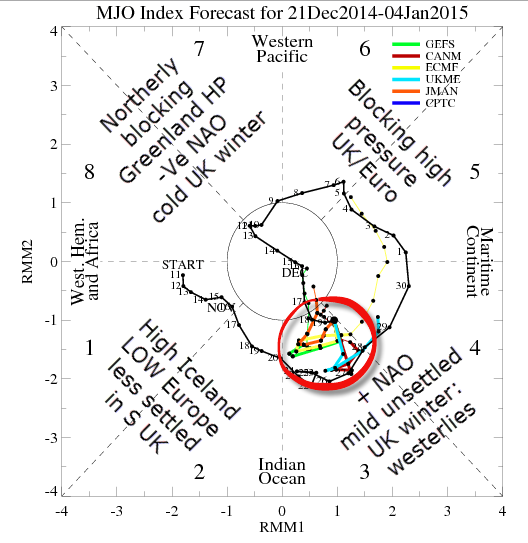 In contrast, the MJO seems to favour more of the same unsettled westerlies for a while at least. Quite possibly it will probably be a mix of the two! This is suggested by lastest output by the CFS showing some zonal westerly weeks and some potential cold northerlies with the subtle position of HIGH and LOW pressure being critical to the outcome. 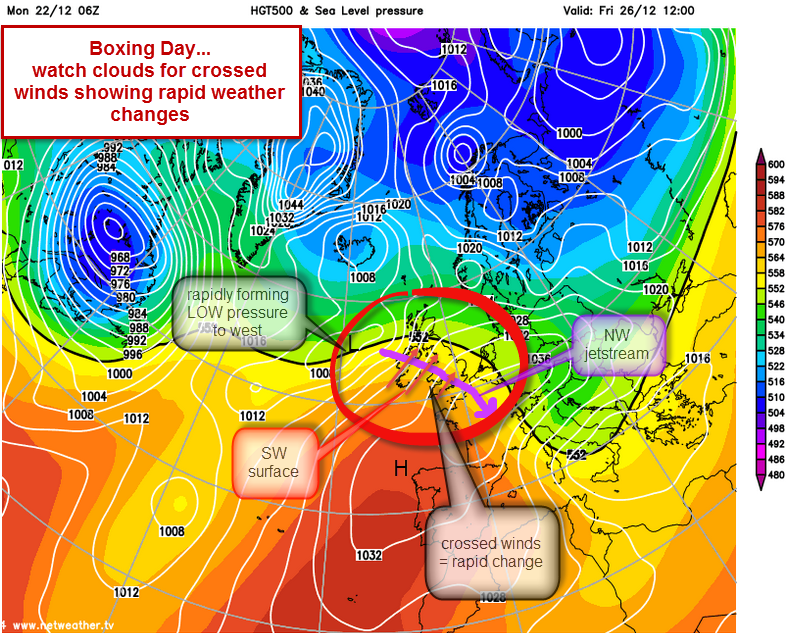 Lots of interest over the Christmas period and beyond, keep watching the weather!